Like most of downtown San Francisco, Chinatown was reduced to rubble by the earthquake of 1906. But anti-Chinese sentiment was virulent in those days, and so the neighborhood's residents suffered not only the destruction of their homes and businesses but also the threat of complete removal from the center of the city. Within days, a citizens' committee had organized to promote the establishment of a new Chinese community in Hunters Point. Chinatown fought back. The Chinese government suggested it might be happy to relocate its lucrative trade to another port – say, Seattle. The merchants of Dupont Street (today's Grant Avenue) suggested they might be happy taking their lucrative tourist business to another city – say, Oakland. 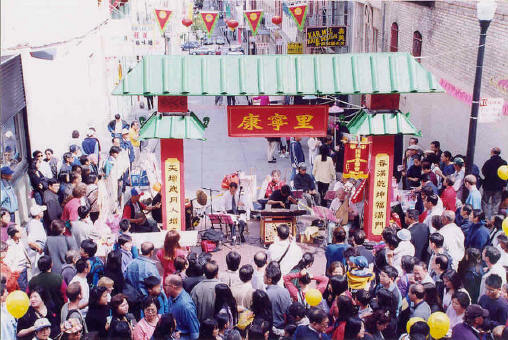 And a citizens' committee organized to promote the rebirth of Chinatown, with a design explicitly intended to attract tourists – what art historian Anthony Lee calls "a fabulous fabrication for the benefit of its visitors' desires." When you take Aunt Susie on a tour, this Edwardian fantasy is what you see. Now, Wilma Pang suggests, it's time to take the fantasy to a new level. How did the idea of a traditional Chinese gate come about? One spring day in 1998, some architect friends and I were leisurely strolling on Grant Avenue, passing the gate on Bush. We stopped at the entrance to Commercial Street and envisioned a traditional Chinese gate there. "It is a perfect spot to have one. Looking straight ahead, there is a beautiful view of the Ferry Building and on the immediate left, a traditional Chinese-styled building," commented Paul, the architect/builder of the Jade Emperor Taoist Temple located next to the Chinatown Branch Library. I immediately asked him to come up with a rough design of a gate on that spot. And I have kept his sketch ever since. Last year right after 9/11, people were afraid to go outside. Chinatown was no exception. Streets were deserted. Since the Moon Festival was scheduled for a few days after the tragedy, it was hard to decide whether to cancel the event or not. Thanks to festival director Eva Lee's dedication and perseverance, the festival did take place. And since the theme of Moon Festival 2001 was "Old Shanghai," I thought that a traditional-styled gate on Commercial Alley would be most appropriate. Eva Lee supported the idea. At the eleventh hour, sculptor Hans Wong agreed to build a temporary gate out of wood and light materials. The finished artwork looked so real, as if it existed there always, that it drew a huge crowd. It even attracted the attention of the three supervisors who came to the festival, Aaron Peskin, Mark Leno, and Leland Yee. Tourists and locals alike stopped at the gate and posed for photos. After the two-day event, merchants on Grant Avenue talked about having a permanent one. They loved the structure. Tane Chan, the owner of Wok Shop, wanted to organize a drive to have City Hall build one. A year has gone by and there is still strong sentiment for having a permanent gate. As a longtime resident in Chinatown, I sincerely wish that one day in the near future, this landmark fixture will become a reality. Pan Entertainment Inc. and Building by Design of San Francisco have carried the scheme further, putting together a proposal to build two gates on Commercial Street – a traditional Chinese-style structure near the entrance on Grant, with red columns topped by a green-tiled roof, and a "pan Asian-American" structure at the lower entrance on Kearny, constructed of bricks salvaged from the recently renovated street.